Mike is an award winning designer that has participated in every aspect of the trade show industry from exhibitor to design, art direction and project management. He has won over 24 Best of Show awards for design in the exhibit industry in 24 different trade shows since 2001. Mike is comfortable designing with all types of fabrications, substrates, lighting, sound and video. 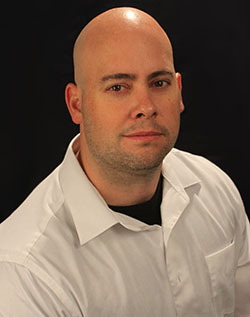 He has designed and Project Managed builds for Pepsi, Microsoft, Logitech, Coldwell Banker, Konami Gaming and 100’s of other large and small companies. Mike’s 18 years in the industry have included positions as Graphic Designer, Art Director, Webmaster, Account Executive, Marketing Manager and On Site Manager. Michael’s unique approach to creating engaging displays can be attributed to his willingness to participate in the actual build stages of many of his designs. Mike has worked with budgets from $2500 to $2.5 million with Exhibit sizes ranging from 100 sq.ft. to 120,000 sq.ft.